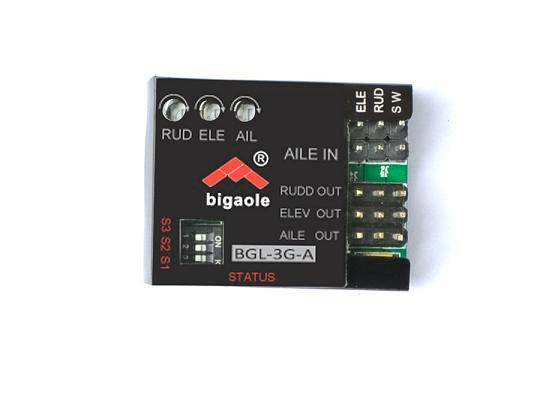 Bigaole, high performance 3-axis gyro. The 3G-A stabilizer is a small lightweight, high performance 3-axis gyro. ​The 3G-A supports three types of planes. Standard, flying wing and V-tail.. With the latest MEMS technology the 3G-A provides excellent stability, flexibility, and reliability. Whether you're looking for sharp predictability from a 3D plane or want to have the ability to fly smoothly in wind, this gyro is a rock solid performer. Features 3 modes, gyro off, normal flight and AVCS. Great 3D flight performance without compromising stability. Lightweight, compact design. Easy to set-up using independent gain adjustments for aileron, elevator and rudder.